The foodish adventures of a Personal Chef living aboard a 26 ft sailboat on the Gulf Coast of Florida. Neapolitan comfort food!! This is what an Italian-American Meatball Sub wants to be when it grows up! 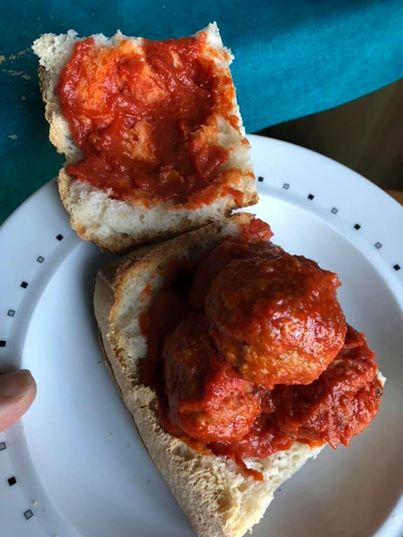 A week or so back, my old office-mate-turned-internationally-recognized-food-photographer --Luciano Furia -- who was born, raised and lives in Naples, Italy -- posted a picture of this dish sliced open so the inside could be seen. As you can see from his picture, Cuzzetiello is basically a loaf of long Italian bread cut into lengths and stuffed. Usually with polpette -- meatballs -- but other things can be used as well. A fork is used to remove some of the bread from the center of one end, and the cavity is stuffed with one or meat meatballs. The "sandwich" is then dipped into a steaming bowl of ragu/marinara sauce and devoured. I made my version of Cuzetiello with polpette di melanzane -- that is "meatballs of eggplant". Now thatsa meata ball sanda wich!!! Needed a fast dessert and had a grapefruit handy. A different way to enjoy this tart-sweet citrus! This is a Technique, not a fixed recipe -- some spice... some sweet... to taste. Put a pat of butter in the center of each fruit half. Add sweet and spice to taste. Place doctored fruit halves on a tray or baking dish and broil for 3-5 minutes until everything is nice and hot and the butter is melted. A little different posting this week. Just to keep you guessing! Yes, you read that right -- Cucumber Curry. A really interestingly different and very tasty Indian dish. It all started when we were gifted with an English cucumber, not the garden variety 'pickle cuke'. Combine the spices in a ramekin. Have the other ingredients handy in a bowl. In a splash of oil in a medium hot skillet, heat the spices, crushing the mustard seeds a bit to release more flavor. Add a couple tablespoons of water to the spices, then add the rest of the ingredients. Carefully stir and cook things partially covered for 10-15 minutes. Plate and serve with rice, or as I did, with spiced lentils. This curry was amazing good -- flavor filled, not hot-spicy -- really tasty. I will be making this more often. I agree with most of those. But how the heck did coconut get that high in anybody's ratings? Top Ten??? Since Blue Diamond Almonds didn't make the list, I suppose the data is legit; but still! I would have guessed Maple to be one of the top ten, since maple syrup is such a common flavor. But coconut? Just so you can see -- not everything I do turns out good or right. At least not the first time! I've seen these on episodes of the Great British Bake Off, used in several ways -- light and airy cookies, or as a base for a Pavlova, an elegant French desert of fruit topped with whipped cream. A meringue is basically egg whites (yolks need not apply) whipped into stiff peaks with sugar and flavoring(s) added. Think of the topping for lemon meringue pie as a baked-stiff stand-alone item. Then, a couple days ago, Sally sent me an article about something called Aquafaba, which could be made into egg-free meringues and such. What?? Ok. Aquafaba is obviously a made-up name. It's what vegans call the thick 'juice' in a can of garbanzo beans. Drain that juice, don't throw it away, and put the garbanzos into some other container. In addition to the Aquafaba, you need 2/3 cup of granulated sugar that you've taken for spin in your spice/coffee grinder. And you'll need some sort of flavor -- I used Orange Extract. You could use peppermint, lemon, or some other kind of extract. Other things can be used as flavors too -- powdered coffee grounds, cocoa powder, etc. But start with a liquid extract until you master the process. Pre-heat the oven to 250F. Yes 250, not 350. These bake low and slow. Line two large baking sheets with parchment paper. With the whisk attachment on your mixer, and a clean, dry stainless mixing bowl, start whisking the Aquafaba, working the speed up to max. A stand mixer is ideal, but I did it with a hand-held electric mixer. Once the foam stage goes away -- about 10 minutes of whisking -- add the sugar a heaping teaspoon at a time. Whisk away until you get stiff peaks. Then add the flavor agent, and whisk again until the meringue is VERY stiff and glossy (this is where I messed up, I think). The whole process should take around 15-20 minutes (that's why a stand mixer is ideal). Using a tablespoon or piping bag, dollop mounds of the meringue about 1.5-2" in diameter, onto the parchment paper until you use up the batch. Mine looked pretty nice I thought. Bake for 1.5-2 hours (yep, that long) until the meringues are firm and lightly browned. This is where it all fell apart! I can only guess that I did not get sufficiently stiff peaks and a glossy finish to the meringue. As you can see, my nice pretty mounds of meringue fell really flat! The flavor was good, but we had meringue "chips" not mounds of baked fluff!!! I swear, you can never tell, from taste alone, that these meringues when done right, were made from the aquafaba at the bottom of a can of garbanzos. I WILL MASTER THIS TECHNIQUE! We eat a pretty good amount of fish. We both love Cod as panko-crusted shallow-fried filets, in Seafood Pie, in Icelandic Plokkfiskur, and many other ways. Sally really likes Salmon, too, but I've gotten a bit tired of salmon-this and salmon-that. I like smoked salmon; Sally isn't fond of anything smoked or smoky.
. This is my first recipe, made for Mum Lunch. Lay the filets in a 9x13 baking dish. In a small skillet, saute the onion and garlic in butter until the onion is soft and translucent. Top the fish with the onion mix, 2 Tbsp lemon zest, black pepper and half the julienned basil. Pour the citrus juices over all, and bake for 15-20 minutes until flaky. Top with additional basil as you plate the fish. I served it with baked potatoes and green beans with sliced almonds. How I wrote last week's blog and didn't post it I don't know! Blame it on the weather! Long names for this week's delectable dishes. But don't let that stop you from trying these goodies! One of my favorite early TV chefs was Jeff Smith, The Frugal Gourmet out of Washington state. To him, frugal did not mean 'cheap', it meant 'wise use of resources' -- especially ingredients and time. In some ways this is an homage dish to what he taught me. I did a wedding reception for fifty people last weekend, and as things happened, I had some "odds & ends" of ingredients leftover. So I decided to be frugal and use up some of those things to make our dinner Tuesday night plus leftovers for Sally's lunches. The unique leftover ingredient, for me, was a large can of Italian Peeled Tomatoes -- the well-known San Marzano variety of "plum" tomato -- peeled whole fruit and puree. I don't normally like canned tomatoes -- they're typically too acidic. I got these special tomatoes for one of the wedding dishes I made, but ended up with an extra can or two because I was buying 'mass quantities' from the local GFS Restaurant Supply grocery. First I layered ingredients in a 9x9x3 baking dish -- eggplant, onion and garlic, with a drizzle of EVOO. Then I separated the whole tomatoes from the puree, and poured the puree over the layers. I folded this together with a spatula, then sliced the tomatoes into 3 or 4 pieces and folded them in as well. Next I folded in the breadcrumbs and the powdered Romano cheese, stirring well so that everything got a nice coating. After that it was time for each of the other cheeses in turn. Pop the resulting dish in the oven for 30-45 minutes until you get a nice golden cheesy crust. Let it rest a few minutes before serving. Because of the high quality ingredients, the real flavors come through, and this Italian dish does not need any herbs or spices! What do you do when you get a beautiful head of cauliflower? Roast it whole, of course. When you live in Florida? Glaze it with OJ, naturally -- everything goes better with orange. 1 Whole head Cauliflower -- your choice of color, but I had white. 12-20 leaves fresh Basil, chopped. Put the cauliflower stem down in a baking dish. Use a kitchen paint brush (I like 1" wide) to brush the thick OJ concentrate over all the exposed cauli. Scatter chopped basil on top. Bake for at least 1 hour, glazing the cauliflower every 20 minutes with additional OJ. Cooking time will vary with the size of the head. Test for doneness with a long-tined meat fork. Add a final sprinkle of basil leaves at the end so that they are nice and green and flavorful when you slice into wedges and plate with some of the orange gravy from the bottom of the baking dish. BTW -- I pureed the leftover "brain", added some half & half and a bit of almond milk, some sautéed celery, plenty of white pepper and a pinch of salt, and we had a great #MakeoverMyLeftover soup that my friend Chef Susanne Duplantis would be proud of. Checkout her website for some really interesting ideas on leftovers! Cook some broccoli al dente -- nuke it, boil it or roast it. Make a White Sauce -- some melted butter, some flour, cook a minute, start breaking it back down with some dairy. Add cheese -- yellow or white, sharp or mild. I used wedding leftover Mozzarella -- and slowly melt it into the dairy whisking all the while. Balance the amount of dairy and cheese until you get a nice cheesy sauce. I was looking for something 'different' for Saturday night's dinner, and this fit the bill! We normally associate rice & bean recipes with Mexico, the Caribbean and Latin America but this just sounded right. Saute the garlic in a splash of EVOO in a largish pot. Stir in the rice, garbanzos and lemon components. Add the greens and some pepper, cover, and let the greens wilt for a few minutes. Add a bit of water is there's not much liquid. Stir to combine, and plate. While we ate (it was pretty tasty 'as is') we talked about what could take this dish up a couple notches for the next time. Toasted pine nuts would be a good addition. Toasting the garbanzos would also add depth of flavor. We were divided over the possibility of adding some sautéed mushrooms. Try it and tell me what you think! Just two recipes this week, but both are exceptionally tasty! Gulyas -- or Goulash -- is a Hungarian/Czech dish that migrated to American and suffered a "sea change" (as did many European dishes). Normally made with beef or pork, onions and peppers, in a tomato-based sauce spiced with paprika and other spices. This version is closer to the original Central European dishes, but with mushrooms substituting for the meat. We got a Mushroom Sampler of locally grown 'shrooms the other day, and I thought this would be the perfect vehicle to showcase the tasty fungi. Cook your pasta according to package directions. Reserve. Chop the mushrooms into 1" pieces or thick slices and reserve. * If you can't find a commercial goulash spice blend, start with 2/3 Sweet Paprika, 1/3 Hot Hungarian Paprika, and a pinch of fresh ground black pepper. Mix together, taste, and adjust to your taste. Forget salt, garlic powder, onion powder or those kinds of things. Try a bit of ground caraway seed. Sweat the onion until it just starts to darken. Add the garlic and cook a couple minutes more. Add the tomato, zucchini, goulash spice blend and perhaps a 1/2 cup of water. Continue simmering until the zucchini pieces are almost tender. Add the mushrooms, cover, and reduce the heat, and cook until the mushrooms are tender. Re-heat your pasta by dunking it in fresh hot water, and plate, topping with the goulash. Not just almond flavored, these are gluten-free almond flour bites of heaven! Just sweet enough. Simple, easy, and oh so tasty! Sally got me a bag of Almond Flour at Costco the other day. Something I've not messed with before. Then she comes up a couple days later and says she's 'volunteered' me to make a gluten-free dessert for one of her work potluck parties. These cookies fit the bill exactly! In a bowl, combine the flour, baking powder, sweetener and extract. Use a wet fork to stir everything together until well blended. This is sticky stuff! Parchment line a baking sheet. Spoon out tablespoon sized dollops of dough spaced about an inch apart. This recipe will make about 24 cookies. When they're all laid out, use a wet fork to press the cookies down in two directions to no more than 1/4" thick disks. Bake for 15 minutes or so, until golden brown on the edges. Cool them in the pan for few minutes before transferring to a cooling rack to cool completely. Yes -- the squash is in the dish as well as on the dish! Cook the pasta according to package instructions. Reserve. Cook the peeled & cubed squash -- bake or nuked, your choice. If you nuke the squash for about 10 minutes you can have the sauce finished by the time the pasta is cooked. Reserve 1 cup of cubes and place the other 3 cups in the food processor. Add the clove spice and the half & half, and take the squash for a spin to make a creamy sauce. Add the peas and reserved squash cubes. Top with fresh cracked black pepper -- you really don't want a sweet pasta sauce, do you? Ladle over the hot pasta and serve as you see at the top of the page. This is an ever-changing dish that dates back to our primitive ancestors cooking in, or over, an open fire with clay pots. Any root vegetables, and many surface veg will roast up fine. Toss the veggies with EVOO and sprinkle with salt and pepper or any spice blend that appeals to you. I set the oven at 400F and roast for 30-45 minutes. Not Spankopita, but still tasty. The thing I dislike most about spinach is de-stemming it! We've been getting a lot from acquaintances and I needed something to use up this late-season thick-leaved bounty. This one's really simple. Here's how I de-stem spinach: Stack together eight or a dozen leaves with stems aligned. Press down on one side, and cut right at the stem line away from your fingers. Brush away the chopped leaves. Cut the stems away and keep the 'half leaves'. Nuke the spinach on High 3-4 minutes until just wilted. In a large-ish bowl combine the beaten eggs, cottage cheese, and flour. Fold in the wilted spinach and mozarella. Spoon filling into pie crust and bake 40-45 minutes until center is set. One of my Cabana breakfasts for Airbnb guests is Moroccan Shakshuka, which I've written about here before -- basically eggs poached on top of spiced diced tomatoes. The other day a guest asked if the dish came with bread/toast... and it made me think (you know how dangerous that can be!). Well, I found this recipe and decided to give it a try. The guest, who was in Morocco last year, tells me this recipe is pretty tasty and authentic (even if my was a little too dark on top. With a whisk together the beaten eggs, yogurt, oil and hot water. In another bowl combine the flour, cumin, baking powder and salt. Add the wet ingredients to the dry and continue whisking until the batter is smooth. Let the batter rest while you preheat the oven to 450F (the original recipe called for 475F but that seemed to be too hot). Oil the bottom of a heavy oven-proof 8-9" skillet or pan and then add the batter. Spread things around to cover and smooth. Bake for 30 minutes or until the top is deep brown (not quite burnt like mine was) and the center is set. Cool before slicing and carefully removing from the pan. Serve with butter and/or jam. This is the dish that Sally's Mum requested for our first Lunch With Mum of the new year. I love shrimp, but I'm no a fan of "peel & eat" or "peel & cook & eat". Here we can get a wide range of Gulf Pink shrimp which are peeled and pre-cooked. Start the grits, water and dairy cooking in a largish pot. This will take about half an hour. Meanwhile, in a skillet, sauté the shrimp in butter and oil for a few minutes, with a healthy dusting of a Cajun spice blend. I like Healthy Solutionstm salt-free Cajun Seafood Seasoning. Reserve. Now season the grits with about 1/2 Tbsp of white pepper, and continue cooking. White pepper has a distinctively different, pleasant taste than regular old black pepper. When the grits are basically done, add the goat cheese in 'dollops', and stir the mixture while the cheese melts. Serve the grits in a pool on a plate, with the warmed shrimp artistically arrayed on top. To compliment my Shrimp & Grits, I made a tangy daikon-doctored coleslaw with a fabulous dressing. Daikon is a white radish the size of your forearm, which can be found in most megamarts or, if all else fails, an Asian market where it's a staple in Asian cooking because it retains its crunch but gets slightly sweet when stir fried. Combine the slaw mix and the daikon is a largish bowl. In a small bowl stir together the rest of the ingredients. Not much sugar in here; we're not fond of really sweet dressings. Spoon the dressing over the slaw while stirring. Don't over-dress the slaw -- there's nothing worse than coleslaw soup! Chill for at least an hour before serving. No this is not a new Italian sports car!!! I've loved Focaccia ever since my first bite of this bread years ago. Problem is that most recipes are long and involved processes of rising and kneading the dough several times. This recipe isn't like that -- this is a No Knead bread! Makes 2 loaves. With a wooden spoon or spatula, combine half the oil, the yeast, salt, sugar and flour in a large bowl, making a rough dough. Use clingfilm or another lid and let it rest on the counter for "about 2 hours". Can be stored in the fridge for 2 weeks. Put a baking stone on the middle rack of the oven, and preheat to 425F. Pour the remaining oil in a 9" cake pan and swirl to cover the bottom. Take half the dough (it's sticky) and dust it with flour. Reserve the rest of the dough in the refrigerator for later in the week. Dust your hands with flour and pull the dough into a smooth-skinned ball by pulling the dough over, rotating a quarter turn and repeating 3 more times until the top is a nice smooth ball. Form the ball, smooth side up, into a disk about 6-7" in diameter and place it, smooth side up, into the oiled cake pan. With your dusty hands, spread the dough evenly out to the edge of the pan. Cover with lid or cling film and let the dough rest and rise 20 minutes. Sprinkle dough with the rosemary, or Italian Seasoning, place the pan on the hot stone in the oven and bake for 20-25 minutes or until GB&D. Cut into wedges and serve warm (or not) with butter. Even with the largish airpocket this focaccia had a nice 'crumb' -- crisp outside somewhat chewy inside. This one's a Keeper!! We usually make cornbread with ground cornmeal -- yellow or white. I got a short-notice request for side dish to pulled pork, and cornbread sounded just right. But I didn't have regular corn meal or the package of Jiffytm Cornbread Mix that I've used for 25 years as a basis for my 'doctored' cornbread. I did have masa harina, the Mexican ground hominy corn meal with its distinctive flavor, and I thought 'what the heck'. So I found a simple recipe and doctored it with frozen sweetcorn and diced red bell pepper. Here you go. Preheat the oven to 425F and line a 9x9 baking dish with parchment paper. Combine the flours, baking powder and salt. In another bowl combine the dairy, honey and eggs; then add the wet to the dry ingredients and stir with a fork. Add the corn and diced red peppers and bring it all together. Spread the dough mixture in the baking dish, and bake for 20-25 minutes or until GB&D (Golden Brown & Delicious) and a toothpick comes out clean. The result isn't as sweet as conventional cornbread, and has that wonderful (to me) 'tamale tang' of corn tortillas. An excellent accompaniment to chili, pulled pork, shredded beef or smoked chicken!